It’s a miracle of life: the transformation of a single cell to a new human in just nine months. While you get ready to welcome a baby, your body undertakes the amazing feat of growing this new person. Fueled by the foods you eat, your developing baby grows faster in utero than at any other time in his life. We talked with some Alaskan experts who shared tips for eating smart through pregnancy. “A lot of babies’ health is established during the prenatal period, so you want to provide all the nutrients they need,” says Jennifer Johnson, Women, Infants and Children (WIC) nutrition coordinator for Alaska. Sure, you’re eating for two, but more importantly, you are getting nutrition for two. Eating during pregnancy is challenging for moms bombarded by nausea, strong food cravings or aversions. Luckily, “the healthy pregnancy diet is similar to a healthy diet in general,” says Johnson, so you still have a broad range of options. From eating plenty of fruits, vegetables and whole grains to limiting sugar, common sense food choices are a great place to start. As far as calories, you don’t need as many as you might think. 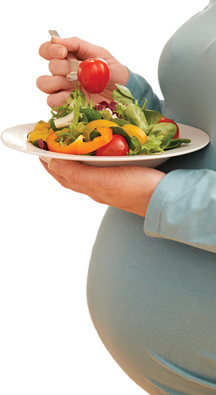 “Women in their first trimester require minimal to no additional calories,” explains Kerri Metz, clinical dietitian at Providence Alaska Medical Center. “However, calorie needs do increase as the pregnancy progresses.” You need an additional 350 calories per day in your second trimester, and 450 to 500 more in your third, explains Metz. Johnson agrees, and says you should “try to make those calories count with things the baby needs.” Be especially mindful of sugary beverages, which make up the number one source of calories in the American diet, says Johnson. Whether they come in the form of soda or fancy lattes, these drinks slurp up your extra calorie allotment and provide no nutritional benefits for you or your baby. While you should nix the empty calories and focus on eating healthy in general, pay attention to some especially important nutrients. “Folic acid, iron, calcium, vitamin D and vitamin C are specific nutrients that women need more of when pregnant,” says Metz. Fruits and vegetables provide the best dietary source of water-soluble vitamins (the ones your body can’t store) such as vitamin C or the B vitamins, including folic acid. “Vitamin C is important for the development of a baby’s blood, skin and other organs and helps mom and baby have a strong immune system,” says Johnson. Iron, another pregnancy nutrient, is required for growth and for the extra blood you gain, explains Johnson. Meats and beans are good sources of iron, or “choosing ready-to-eat cereal as a snack as opposed to chips or crackers will help provide additional iron,” suggests Metz. Pay attention to your own health too. For instance, without adequate calcium intake, your body will draw it out of your bones and teeth for your developing baby. Johnson recalls an old wives’ tale that says women lose a tooth for every child they have. The tale stems from the days when women had less access to nutrition and suffered the consequences of a lack of calcium. Nowadays, thankfully, calcium is easy to come by in foods such as dairy products and leafy green vegetables. However, even with a healthy diet, getting adequate vitamins and minerals is so important that your doctor may also suggest you take a prenatal supplement. Your growing baby also needs plenty of healthy protein and fatty acids. The protein you eat in things like meats, eggs, soy and beans helps provide the building blocks for your baby’s growth. “Fatty acids are important for the development of the baby’s eyes, brain and nervous system,” says Johnson. Some types of Omega-3 fatty acids are naturally available in nuts (especially walnuts) and flax seed. But if you like fish, wild salmon is one of the best sources of Omega-3s, says Johnson. Speaking of fish, you do want to avoid certain species that tend to be high in mercury and other pollutants. For the most part, avoid eating fish that live a long time. Species such as king mackerel and shark are long-lived and have more time to accumulate pollutants. Some mercury is also present in canned tuna fish so no more than 12 ounces per week should be consumed. Other fish that can be eaten in moderation are shrimp, crab, tuna steak, catfish, cod and tilapia. The Alaska Division of Public Health, which publishes fish consumption guidelines, does not recommend any limits for Alaska salmon. Other pregnancy food “no-no’s” exist to protect you from food-born illnesses, for which pregnant moms face an increased risk, according to Metz. Before you consume milk, juice, soft cheese or products with raw eggs, you should read the label to make sure it has been pasteurized. Unpasteurized foods are hazardous to women who are pregnant because they can make them very sick and could harm the baby. Also, “pregnant women should not consume hot dogs and deli lunch meats unless they are heated until steaming hot,” says Metz. Put your sushi cravings on hold through pregnancy, as it is best to avoid any raw fish. Hold the raw sprouts as well, according to The US Office of Women’s Health “Foods Don’t” guide for healthy pregnancy. Even considering foods you should avoid, you still have lots of options for tasty fare that will keep you healthy and help give your baby the best start possible. “By making smart dietary choices while pregnant, mothers can help provide their babies with a solid foundation for life,” says Metz. So bon appetit, mamma!